Voice search is rapidly moving out of the realm of sci-fi and into reality. Google is working furiously to improve its voice search capabilities and Microsoft is working furiously to catch up with Google. 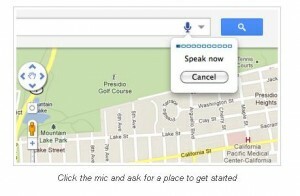 In the latest news, Google has released voice search on Google Maps. As with the other desktop and laptop voice applications, it only works with Chrome. But if you’re on a smartphone, Android will see you right. According to the official blog, voice search on maps will take away the frustration of trying to spell tricky city names, like Whanganui (New Zealand) and Thuringowa (Australia). It’ll also make it easy to ask for directions and allow you to use Earth layer to virtually fly over destinations. Voice search is available on all smartphones that use Android 2.2 and above. Its features include voice-to-text messages and emails; voice activated instructions such as playing music; voice activated calls; voice activated search and direct access to websites (just say the name); and voice-to-text notes. According to Cnet’s Jay Greene, Google’s voice search works, and it doesn’t. He tested the application in his office and found that nearby conversations can confuse results. He found that searches based on phonetics don’t always give you what you want – paella comes back as pie. He found that nonsense searches sometimes deliver surprisingly good results and that asking Google to do sums and find images works very well. But, translations don’t work as well as Google would have us believe. Window Phone 7, or Mango, will support TellMe, a voice search app that will help Microsoft compete with Google. It also provides map search features, as well as voice activated calls, Bing search and voice-to-text messages. It seems rather obvious that voice search technology would find a place among music search queries. Sites like Midomi.com will find specific songs after users have hummed or sung at least 10 seconds of the piece they’re looking for. On Search Engine Watch Rob D Young supposes that voice search technology could make typing a thing of the past. However, I humbly suggest that the simple act of typing, like writing by hand, aids thinking and should never be banished.